The sweeping love story of two people who defy the conventions of their age to follow the dictates of their hearts. 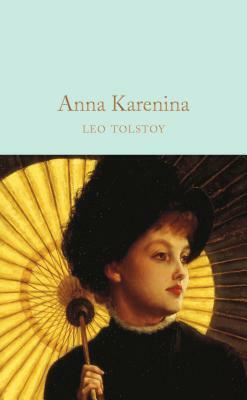 Trapped in a stifling marriage, Anna Karenina is swept off her feet by the dashing Count Vronsky. When the truth about their passionate liaison comes out, Anna's husband is more concerned with keeping up appearances than anything else, but at last he seeks a reluctant divorce. Rejected by society, the two lovers flee to Italy, where Anna finds herself isolated from all except the man she loves, and who loves her. But can they live by love alone? In this novel of astonishing scope and grandeur, Leo Tolstoy, the great master of Russian literature, charts the course of the human heart. Count Lev (Leo) Nikolaevich Tolstoy was born at Vasnaya Polyana in the Russian province of Tula in 1828. He inherited the family title aged 19, quit university and after a period of the kind of dissolute aristocratic life so convincingly portrayed in his later novels, joined the army, where he started to write. Travels in Europe opened him to western ideas, and he returned to his family estates to live as a benign landowner. In 1862 he married Sofia Behr, who bore him 13 children. He expressed his increasingly subversive, but devout, views through prolific work that culminated in the immortal novels of his middle years, War and Peace and Anna Karenina. Beloved in Russia and with a worldwide following, but feared by the Tsarist state and excommunicated by the Russian Orthodox church, he died in 1910.